The automobile industry in Poland makes up a sizeable part of the Polish economy, accounting for about 11% of Poland's industrial production. Poland is one of the largest producer of light vehicles (passenger cars) in Central and Eastern Europe. As of 2013 Poland was the 23rd largest automaker in the world. The first Polish company that produced automobile vehicles, Ursus, was established in 1893, and became known for a line of tractors produced since 1922. After Poland regained independence in the aftermath of World War I, Polish automotive industry produced a number of light military vehicles, such as armored cars tankettes and light tanks (7TP being the most advanced model). Civilian automotive production also existed, with the Centralne Warsztaty Samochodowe (later, Państwowe Zakłady Inżynieryjne) being the most notable company. Nonetheless, compared to more industrialized countries in the Western Europe, interwar Poland is seen as having rather limited auto producing capacities before World War II. Interrupted by the war, automobile production in Poland resumed afterward, and the socialist People's Republic of Poland produced near 400 thousands vehicles by 1980. 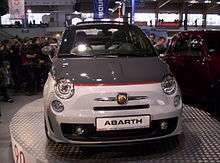 Of models of that era, the best known were the Warszawa, Syrena, Polski Fiat and the Polonez passenger cars. 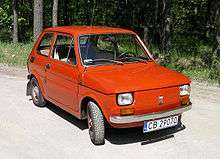 The Polski Fiat 126p or "maluch" was a particularly iconic car of that period. Production increased following the fall of communism, and peaked at 650,000 vehicles around 1999, declining for the next few years. 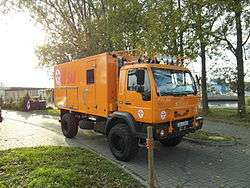 In the early 2000, around the years 2002–2003, Poland produced about 300,000 light vehicles a year, a number that increased once again after the accession of Poland to the European Union in 2004, having doubled by the mid-2000s and then almost tripled by the end of the decade around 2009. For the period 2007-2009, Poland was the second largest producer of light vehicles (passenger cars) in Central and Eastern Europe, after the Czech Republic (and not counting Russia). As of the late 2000s and early 2010s, Polish automotive sector represents around 11% of total industrial production, accounting for about 4% of GDP. The sector employs about 130,000 people, and produces about 800,000–900,000 light vehicles a year. Production of larger commercial vehicles was at about 70,000–90,000 in that period. Most of the sector's output is geared for exports, primarily to the European Union. In 2009 the value of exports from this sector was €15.7 billion, i.e. 16% of all Polish exports. Since 2010, the number of cars made in Poland has been decreasing from 869,376 to 583,258 in 2013. As of that year Poland was the 23rd largest automaker in the world. Major international companies with significant presence in the Polish automotive sector include Fiat, Opel, Toyota, Volkswagen, MAN Nutzfahrzeuge, Solaris, Volvo and Scania AB. Out of those, historically Fiat had a very strong presence in Poland for almost a century: the Polski Fiat assembly plan was established in the 1920s, and while interrupted by World War II, production of Fiat-licensed vehicles resumed in socialist Poland in 1967. Majority of major the sector is controlled by international companies and financed by foreign investment; with the Solaris bus and truck producer being the largest company in the market that is owned by Polish investors. Some models produced in Poland in the recent years include Opel Astra III and IV, the Fiat Panda and the Fiat 500, the Lancia Ypsilon, the Ford Ka, and the Chevrolet Aveo. Fords, Škodas, and Volkswagens are currently the most popular brands, with the Ford Focus, Skoda Octavia, Skoda Rapid, Volkswagen Passat, and Volkswagen Tiguan being the most popular. Leopard Automobile Mielec Sp. z o.o. ↑ Joseph Marcus (1 January 1983). Social and Political History of the Jews in Poland, 1919–1939. Walter de Gruyter. p. 118. ISBN 978-90-279-3239-6. ↑ George Bradford (2010). 1914–1938 Armored Fighting Vehicles. Stackpole Books. pp. 3–4, 49–50, 63–64, 67, 119–120. ISBN 978-0-8117-0568-4. ↑ Andrzej Jezierski; Cecylia Leszczyńska (2003). Historia gospodarcza Polski. Key Text Wydawnictwo. pp. 300–301. ISBN 978-83-87251-71-0. ↑ Michael Moran (2 June 2011). A Country In The Moon. Granta Publications. p. 24. ISBN 978-1-84708-493-4. ↑ Usa Ibp Usa (September 2009). Poland Customs, Trade Regulations and Procedures Handbook. Int'l Business Publications. p. 162. ISBN 978-1-4330-4007-8. ↑ "Production Statistics - OICA". Retrieved 29 September 2014. ↑ OECD (21 September 2005). Trade and Structural Adjustment Embracing Globalisation: Embracing Globalisation. OECD Publishing. p. 270. ISBN 978-92-64-01097-0.